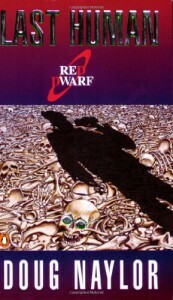 Last Human by Doug Naylor is the third book based on the British science fiction comedy show Red Dwarf. The crew of Red Dwarf accidentally end up in an alternate dimension and they find an alternate copy of their transport ship Starbug with all the crew dead inside except for Lister. They set out on a quest to find what's become of the alternate Lister, but when they find him, he turns out to be a lot more different from Lister than they had imagined. I would say that overall this book wasn't quite as funny as the first two, but it still had parts that really made me laugh and it was full of exciting adventure, so was a pretty good read overall. I think it's definitely worth reading if you enjoyed the first two books. This book picks up right where Better Than Life left off, so you should definitely read it and Infinity Welcomes Careful Drivers before reading this book. There are bits and pieces from the show in this book, but the storyline itself is very different. It's not necessarily a bad thing though. It's pretty cool to read storylines that were never in the show. I'd just recommend not starting this book(or the others before it) until you finish watching the show to avoid confusion.